Data shows airfare costs are down 7% domestically and 9% internationally for season. 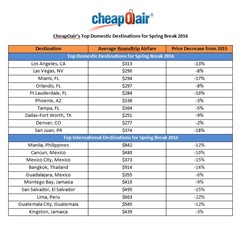 CheapOair, the first flights-focused hybrid travel agency, announced today the top ten international and domestic destinations consumers are traveling to for spring break, between March 1st and April 4th. This year, spring has proven to be an ideal time for travel, as airfares have significantly decreased for top destinations, with domestic prices averaging $302, a 7% decrease from last year, and international prices averaging $546, a 9% decrease from the same period last year. For this year’s top domestic destinations, Los Angeles is the most popular city, with a roundtrip price of $313, down 13% from last year. Out of the top ten domestic destinations, those who may be looking to pay the lowest prices for their trip should consider Dallas-Fort Worth, with an average airfare cost of $251. Of the top ten cities, San Juan, Puerto Rico has seen the largest decrease in airfare price, dropping 18% since last year. Among international destinations, Manila topped the list as the most popular international destination to visit during Spring Break. Lima, Peru, had the largest decrease in airfare cost by far, dropping a total of 22 percent since last year, and Guadalajara, Mexico, had the lowest airfare for a roundtrip, at a price of $545. The fares referenced are averages, calculated based on bookings made beginning January 1st, for travel anytime between March 1st and April 4th, 2016. CheapOair is a flights-focused hybrid travel agency that enables consumers to book online, on mobile apps, by phone or live chat. CheapOair (http://www.cheapoair.com, 1-800-566-2345) bridges the gap between an online and traditional travel agency with certified travel agents available 24/7 to help find deals and offers to destinations worldwide on over 450 airlines, 150,000 hotels, and 100s of car rentals. Partner airlines benefit from access to CheapOair's broad customer base that books high yield international travel and add-on ancillaries at above the industry average. Follow CheapOair on Facebook and Twitter to learn how to travel the world for less.